Purchase this product now and earn 6,000 Reward Points! GLUTATHIONE is a naturally occuring protein that functions to protect cells against free radicals that cause oxidation damage. 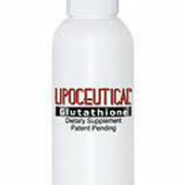 LIPOCEUTICAL GLUTATHIONE is a dietary supplement in liquid form to take orally. We place the powerful antioxidant glutathione in tiny nanosize spheres called liposomes to facilitate absorption into the body. There are 423 mg glutathione per teaspoon. This product is compatible with the Feingold Program. 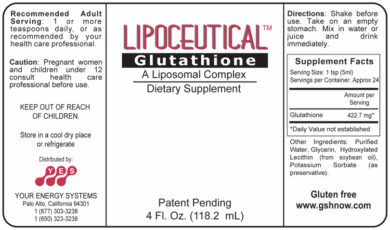 LipoCeutical Glutathione can be stored at room temperature, even after opening. Refrigeration will not harm it. 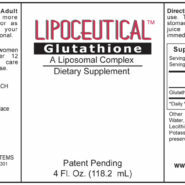 Lipoceutical Glutathione Original Formula (Benzoate-free). 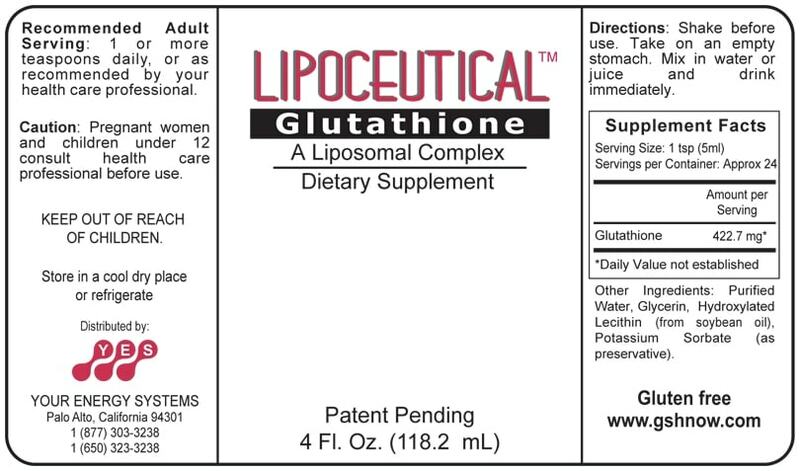 LipoCeutical Glutathione is a liposomal glutathione supplement in liquid form that is taken orally. 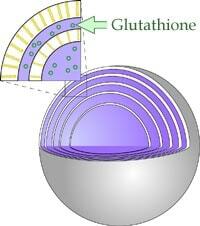 Glutathione, when taken orally by itself, is not absorbed into the body. We place the powerful antioxidant glutathione in tiny nanosize spheres called liposomes, which are absorbed readily into the body. The patent pending process used in creating this product gives it a reliable, extended shelf life. This product is made in a cGMP (current Good Manufacturing Practices) facility which allows us to stamp a use-by date on each bottle. Our product is a liquid that is meant to be taken orally and is sold as a food supplement. The best time to take it is in the morning on an empty stomach. It can be taken “straight” or mixed in water or juice. The recommended adult dose is one teaspoon per day. Liposomes tend to cluster together, so the bottle should be gently shaken. There is no problem if there are tiny clumps. Because glutathione contains sulfur, vigorous shaking will release the sulfur aroma. Liposome encapsulation reduces that aroma significantly. This product does not need refrigeration, even after opening, but refrigeration will not harm it. 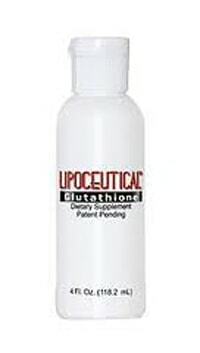 LipoCeutical Glutathione is made by a patent pending process. It is put through rigorous stability testing in order to assure that the product can maintain a long shelf life. That is why we can guarantee the dating that is stamped on the bottom of each bottle. Our manufacturer has an OTC(Over The Counter) drug license. That means they have to adhere to much more stringent manufacturing requirements than a facility that does not. Both their Food license and their Drug license have to be renewed each year with the FDA.